Jugendstil .935 Silver and Amethyst Necklace, Theodor Fahrner, the shaped plaque set with an oval cabochon amethyst, suspending a drop, and suspended from paperclip chain, lg. 3, 20 in., Continental hallmarks, signed, (repairs). 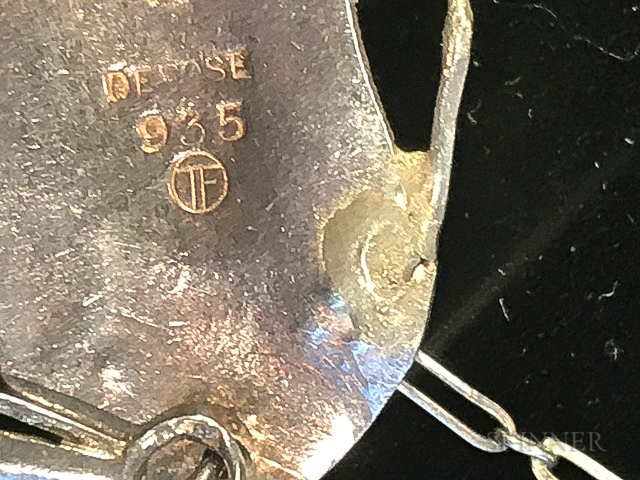 Repair to join, noticed from reverse, bottom right. Acouple of other spots of possible repair, not obtrusive.